Why can't I see the price on every component? I like how many parts are listed, but I'm confused about the available prices and stock. Why are some of them blank? The data that we have is a combination of sources, the most important of which is a database of many of the known components in the world, past and present. 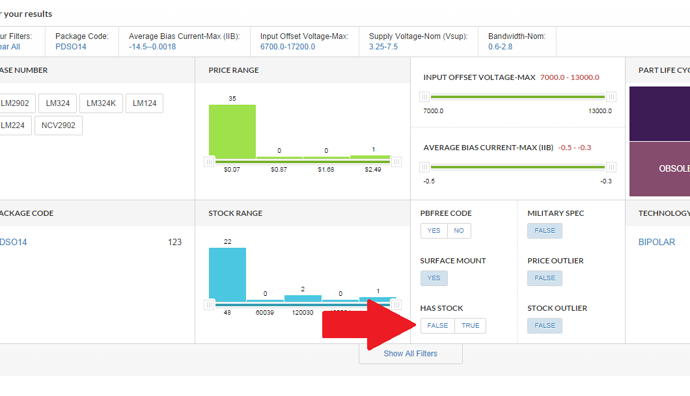 This is important because you might want to know about a part that is on your board (especially the parameters of that part) even if you can't buy it today. This could help you find a replacement for it. The pricing data that we have comes from our sister site, FindChips.com. This data shows all of the available stock at distributors around the world. Once you click on the price, you can view where it has stock.